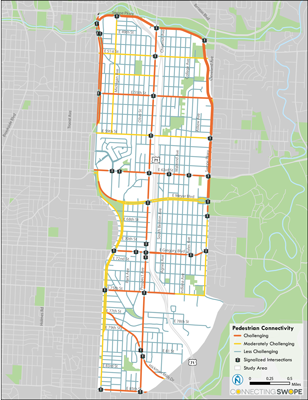 KCATA is looking for ways to improve connections across 71 Highway to the Prospect MAX line, from Swope Parkway to 85th Street. This project is being coordinated with the Prospect Streetscape project, along with Prospect MAX. 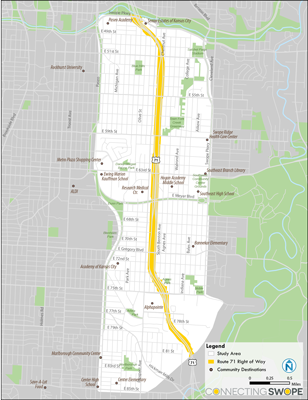 71 Highway runs parallel to Prospect Avenue between Swope Parkway and 75th Street. For transit users, pedestrians, and bicyclists, there are few opportunities to cross the highway; high vehicle speeds and wide intersections hinder accessibility. 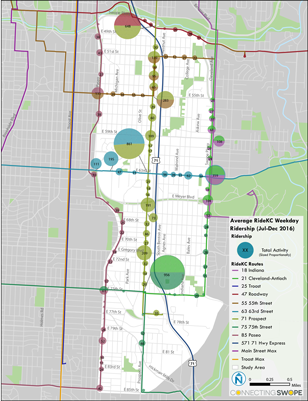 See below for maps showing the area’s transit ridership, sidewalks, and bicycle network. The study is a joint project of KCATA, City of Kansas City, Mo., Missouri Department of Transportation, and Mid-America Regional Council. We need input from people who live and work in this area near Highway 71. A quick survey asks about travel habits for those who live or travel through this area. Your answers will help us identify barriers for pedestrians, transit riders, and bicyclists, and help us understand what options you might want to have in the future. KCATA and other partners in the study are meeting with businesses and organizations along Highway 71 to talk about issues of access and to collect input. Study Area. This study is focused on improving travel from Swope Parkway to 85th Street and The Paseo to Cleveland Ave. Transit map, showing routes and ridership. Sidewalk Map, showing the locations of sidewalks in the area. 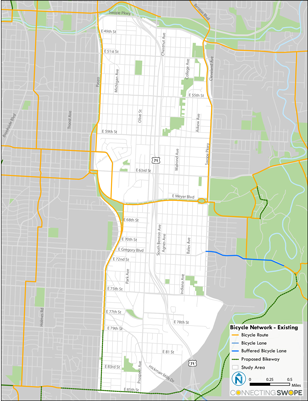 Bicycle network map, showing the location of bicycle facilities in the area. Want to learn more about this study? Please sign up to receive the latest news and events about the Connecting Swope project.